Only in Middle-Earth can you get an entire module out of an inn without it feeling like a cheat, but even here I'm pushing it. Rivendell may be where great decisions are made and Elrond wields the mightiest elven ring, but it isn't the masterpiece it deserves to be. Yet I can't think of a way it could have possibly been done as outstanding as the Lorien module. Unlike the ethereal Golden Wood or the transcendent Grey Havens, Rivendell is rooted in a simplicity so pure it's almost banal. It makes me regret even more that ICE never got around to the Grey Havens module it promised in the '90s. I would have much preferred Mithlond over Imladris, and to see Angus McBride wrestle with more ineffable visions in his cover art. But I digress. The vale surrounding Rivendell is a pocket paradise, as it functions according to Elrond's command of the ring. 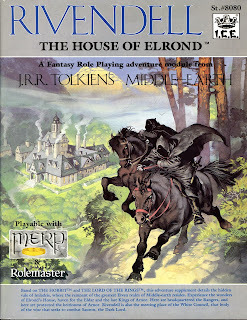 Its powers are completely detailed, and I was so obsessed with the elven rings as a teen that I reworked the properties in more Gygaxian terms (and I always translated MERP statistics into D&D terms anyway). So as I had it, a competent wielder of Vilya could control weather or cause hallucinatory terrain in a 10-mile radius, in line with its primary ability to conceal and protect; heal, exorcise, and restore, fitting its secondary focus on healing; and also fly, create air, gust of wind, and either control winds or cause tornado once/day, per its tertiary relationship with the element of air; plus some generic bonuses common to all the elven rings. Vilya was a definite highlight for me, so much that I entertained scenarios of self-serving characters infiltrating Rivendell to wrest the artifact from Elrond as if that were remotely plausible. Imladris, by rights, is a place of respite, healing, and counsel. The inn is home to the northern rangers as much as the elves, and of course the seat of the Wise. Stats and bios are provided for many elves besides Elrond: Arwen, Glorfindel, Elladan and Ellrohir, Gildor, more. The surrounding culture of Rhudaur is briefly revisited, and the module works perfectly in tandem with Hillmen of the Trollshaws, and there are suggested adventures involving spying for Elrond in the region. It's also perched on the doorstep of Goblin-Gate for any who want to depart hobbit-wise into the Misty Mountains. 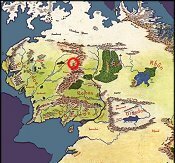 As neither an open colony like the Grey Havens, nor a secluded realm like Lorien, Rivendell is hidden yet accessible, but on a small scale to make just finding it a major task, and this is probably the kind of scenario I'd run, with enemies hot on the PCs' heels a la "Flight to the Ford". The layouts treat fans of The Hobbit and Lord of the Rings to architectural details so often imagined: Bilbo's suite on the second floor, Frodo's room of recovery on the third, Saruman's guest state suite, the dining hall supported by majestic wood vaults and filled with tapestries and chandeliers, the hall of fire, Elrond's library (one of the most extensive of Middle-Earth, second only to that of Annuminas), and of course the council chambers where the fate of the One Ring was decided. While some gamers would call all of this a wasted indulgence, it's a treat to Tolkien fans, though I have to admit there's something about this kind of approach that overdoes things a bit. I'm sincerely fond of Rivendell, but you'll never hear me rhapsodizing about it. Next up: Goblin-Gate and Eagles' Eyrie. This is probably my least favourite module, together with Lòrien. IMHO the author missed the whole point of Rivendell and elven magic, which is based on mystery and subtle magic, melancholy for a past that would never be restored and a present threatened by inevitable change. The essence of Imladris is about preserving a shadow of Eregion into the Third Age and oppose the corruption of the North. But there is nothing of that in the module. Detailing the statistics for the powers of Vilya was the first mistake, and then they did it for eveybody and anything, turning half of the module into a cold and hard catalogue of NPCs and overpowered artifacts that no serious GM would ever put in an adventure situation. The layout of Rivendell is not so bad, although it would have deserved much more attention and quality. The adventure ideas are just OK.
As far as I'm concerned, this module was another chance wasted by early ICE authors. Thomas Morwinsky made a far better job in his articles on Rivendell in OM. I completely disagree with you about the Lorien module, but that's on the way, so I'll say no more for the moment. Your remarks about the nature of magic, of course, come back to the point of what works in novels doesn't necessarily work well in RPGs, and I find myself on both sides of the coin depending on the issue. There's always a degree to which Tolkien's world will be bastardized for gaming purposes (even in places like Mount Gundabad), and for me, to not detail the powers of artifacts like Vilya, would be the wasted opportunity. I've only begun reading the OM articles and enjoy them, and I enjoyed Morwinsky's take on Rivendell. I really loved the article on the Barrow Wights in the first issue.